I use 10,000 points in a Trapezoid based numerical integration analysis model. Just rechecked 16 modes for the EW frustum at 2.45GHz. No resonance. At 2.168GHz there is a weak resonance in TM013 mode. Does that mean that you can only calculate what happens at a given exact frequency? Can you instead calculate at what frequency you get TE012 mode to resonate for NASA's geometry? Yes by using the Excel Goal Seek function. The value for TE012 resonance is ~2.3075GHz. I have seen the light. I believe that we can go to the stars on the power of Slosh. Hey I recalled that right on the money !!! That's a NEGLIGIBLE difference (only 6%) with 2.17 GHz well within experimental and numerical error. We have only Shawyer's word for it. It couldn't possibly be an artifact, could it? When fluid under constant acceleration suddenly has the acceleration removed, there tends to be an impulse as the fluid hits "the front end" and rebounds. The motion of any following fluid is effectively cancelled by the rebounding fluid. You will only get acceleration when there's a force, and you will only get force from slosh when the initial leading edge hits the front wall. But what the data shows is a constant force being applied after power is removed for about one full minute. How the hell can that be "slosh"? Slosh is an impulsive force, not a sustained one. On top of that, a good functioning water cooling system should not produce a "slosh" as the complete tubing is filled with cooling liquid. At best you can get some momentum transfer in corners/bended tubes, but as soon as you stop the pump, the speed of the water drops, hence the kinetic energy of the fluid and so will the momentum transfer and ultimately the acceleration it could/should/would(?) cause. Any other possibilities , beyond a slosh effect that could explain it? I am aware of that Mr. T. I just happen to respectfully disagree and am pursuing a TM theory. Why? In the simple course of nature, I've not seen electricity, by itself, move anything. I cannot say that about magnetism. Too simple? Perhaps, but nature gives us the clues if we just follow her. I am also not trying to convince or dissuade or argue with anyone else. I find it extremely...uhhhh...distasteful and counterproductive. To get a magnetic (H) field banging strongly against those end plates, you need your cavity to be excited in TE mode. But when you compare the electromagnetic energy of a TM mode with the magnetic field banging on the side conical walls, vs. the electromagnetic energy the smaller magnetic axial field (surrounded by the TE field) in a TE mode banging on the end plates: NO CONTEST. You don't see the velocity continuing to increase after power is turned off? Perhaps a fan kicked on in one of those pieces of equipment on the table...but not that any of that is published. Here's Shawyer's own data from the 2008 paper when the turntable was demonstrated seven years ago!!. My crude version below. Both show velocity increasing after power is removed. Thermal? Fans? Floobie Dust? 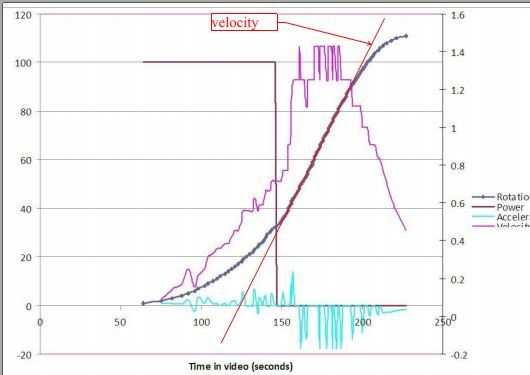 If the vertical axis is position, and the horizontal is time, then this looks like a fairly "constant" velocity slope to me, from nearly the moment that the power is turned off. I'm not analyzing your spreadsheet, just the slope on the graph provided. to provide the calibration force along the thrust axis. So there was a 8.2g breaking force, as measured at the frustum centre line, applied to the rotary table and the EMDrive produced 96mN (9.8g) of Force from 334W of Rf. Which means the table was accelerated by 1.6g of net Force. The cooling system may have tried to produced some movement during the power on but as long as it remained under 8.2g of effective Force, the table would not move. I do note there was a blip on the Velocity curve at the start that may have been caused by the circulatory system. I do agree there is a whole range of unknowns surrounding a large mass of circulatory hot fluid and vertical heat discharge fans cooling the reflected microwave power radiators. And yet, Maxwell's equations tell us that it is the electric field that "does the work" J*E.
Based on TT latest frustum plan, I wondered what would happen if the spherical ends were maximized while the lateral wall was minimized, like in the following drawing. Could such a cavity resonate ? Inside a tapered waveguide, the EM wave fronts are spherical as if radiated from the frustum vertex and as such are at 90 deg to the side walls, so no side wall Forces are generated. Would resonate but the Force vectors would point from all the big end points to the vertex. There are no wall losses in a tapered waveguide with spherical waves inside, so the wall loss issue is not there. Care to compute the forces on the side walls yourself based on spherical waves? I have. That is a false conclusion. There are strong forces exerted at 90 deg to the side walls. As the wave fronts expand, they push back on the walls. I'd also add that when a free moving charged particle enters a magnetic field, it is deviated. But no kinetic energy is added to the particle by the magnetic field. When the same charged particle enters an electric field, it is on the other hand accelerated by the E-field. This is incidentally the basis on MHD accelerators: a crossed E-field and B-field produce the Lorentz force, which acts on all charged particles, accelerating them in the same direction. The B-field modifies the trajectory of each particle but it is the E-field which imparts momentum to the particles. Their combination gives a force in a preferred direction which acts macroscopically on the working fluid. 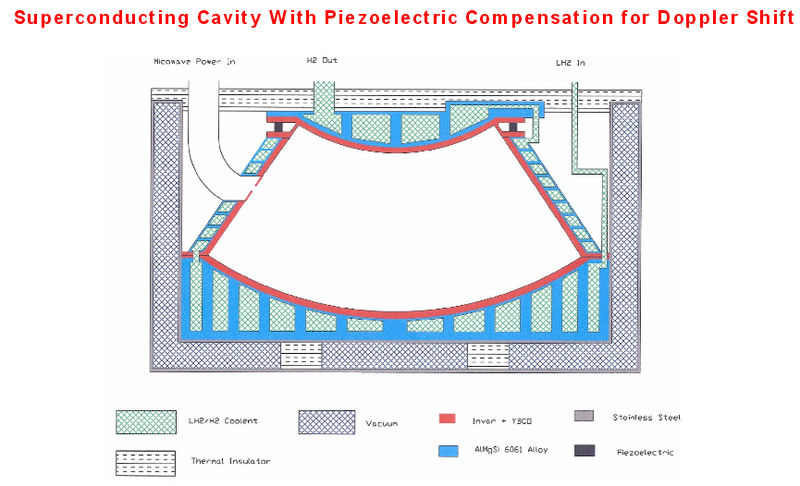 Would seem the peer reviews have accepted there are no side wall Forces in this cavity design. Papers reviewed for publication at Acta Astronautica are reviewed on that basis. Thanks, and a good fit. But it's not the full story. I'm a bit slow today (probably last night's beer with the boys) but finally got it. Will publish as soon as I have the data tidied up. I think this mistake comes from assuming a "ray vector" approach, which is commonly used in waveguide physics. If you assume the ray vector emits from the apex and reflects off the spherical surface, the vector is always parallel to the walls. Then you would conclude that the wave does not touch the side walls, and you would be wrong. When the E field makes a 90 deg angle to the cone wall, it is exerting "Maximum" force, not zero. The component of E that is parallel to the wall is zero, due to the boundary conditions. So the entire assumption of a ray vector falls apart when you analyze the fields and the boundary conditions. The ray is parallel to the wall, which means the fields E and H are perpendicular to the wall. As the wave expands, it exerts a strong Lorentz force on the walls when the wavelength is close to the lateral cut-off diameter. Sorry TT, I have seen worse errors published in peer reviewed journals. Peer review does not guarantee it is correct and in this case, I can assure you with 100% confidence, that it is not.